1. Pumpkins: Obviously one of the first things people think of when they hear the word fall is pumpkins. 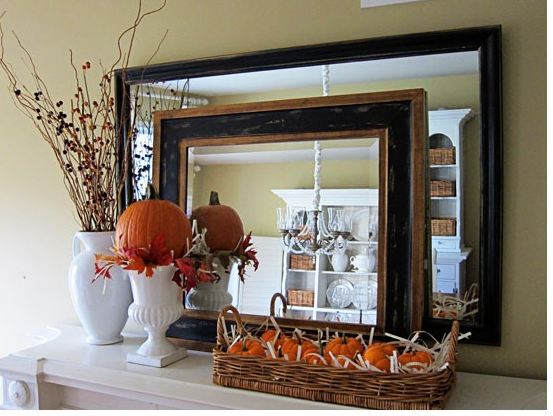 Decorating pumpkins with paint or stamps is a great way to add a sense of elegance to your fireplace mantle. 2.Silk Leaves: Add an autumnal touch to a bookcase or shelves with some textured silk fall leaves. Whether they are placed along a shelf in your home or placed in a decorative apple-picking bucket they will give your home the perfect fall look. 3. Card-Stock Paper: Choose fall colored card-stock paper and make a colorful pendant banner for your mantelpiece. The options with what you can create are totally endless! 4. A simple pop of color: Decorating your home this season can be as simple as adding a pop of color to an already white piece of furniture or using any white pallet as a background and add accents of orange and black. This can be anything from using a vase full of flowers, a decorative pumpkin or a dish full of candy corn. 5.Add Natural Touches: Pinecones, gourds and pheasant feathers can add an organic, woodsy touch to any room in your home. What’s even better about this is that you can find many of these right outside in your yard or while you’re on a walk. We don’t know about you but we can’t wait to try some of these ideas in our own homes this fall; the problem will be just deciding which ones!